Vintage 1920's Carl Zeiss Jena Telita 6x18 Opera Glasses. 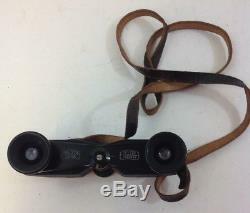 Vintage 1920's Carl Zeiss Jena Telita 6x18 Moeller Prism binoculars. The binoculars have 6x magnification and 18mm objective lens. Image focus is achieved by turning the central focus wheel and balanced at one eyepiece. 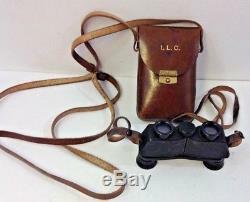 The binoculars have solid metal body and comes with original leather case and neck strap. The binoculars are in good working condition for its age. This item was made by J. Moeller Optical Works in Wedel, Germany. Includes original brown leather case and black leather strap. Highly collectable 1923-6 Carl Zeiss Jena Telita 6x18 opera glasses. This item is vintage and has natural wear & tear associated with an antique item but the lenses appear to be clean and free from dust etc and they focus accurately and provide a nice sharp image. Model: Carl Zeiss Jena "Telita" 6x18 Miniature Moeller Prism Binoculars Serial No. Centre focus wheel and focus adjustment at one eyepiece. Compact size : 115(W) x 65(H) x 27(D) mm (Note: 88mm wide when folded). Comes with original leather case and strap. IPD (Interpupillary Distance): these binoculars can accommodate users with IPD from 53mm up to 92mm. Note: This item is in very good working condition for its age, no chips or cracks on the internal / external lenses, and no mould or dust on the internal lenses. Lenses have been cleaned where possible. The binoculars give a clear and focused image. 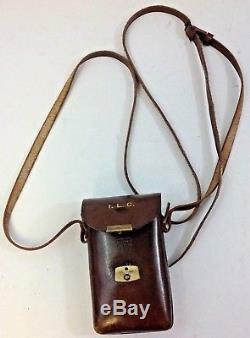 The original leather case worn as shown in the photo. A spring is added to help the smooth movement of the eyepieces when the central focus wheel is turned. Please note there are gold monogrammed initials'ILC' on the case. Some scuff marks & wear on the leather case consistent with its' age. The item "Vintage 1920's Carl Zeiss Jena Telita 6x18 Opera Glasses & Original Leather Case" is in sale since Friday, October 19, 2018. 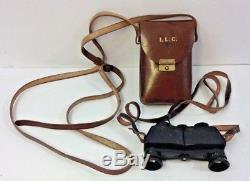 This item is in the category "Cameras & Photography\Telescopes & Binoculars\Binoculars & Monoculars". The seller is "royaltrinityhospice" and is located in London GB. This item can be shipped worldwide.